The Impact LX88 is said to have been designed with performance in mind. NAMM 2015: Nektar is releasing an 88-note version of its Impact LX controller keyboard. Featuring a semi-weighted keybed, this is designed as a performance instrument for more serious players. There are splitting and layering features, and the option to send program changes messages for each zone on the fly. 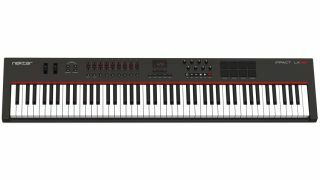 As well as the keys, the LX88 offers nine faders, nine control buttons, eight pots, six transport buttons, eight velocity-sensitive pads, a foot switch socket, MIDI Out and control wheels. What's more, it supports Nektar's DAW Integration technology; if you have a supported DAW, the theory is that controls are automatically mapped, and you should be able to navigate many of your software's features from the keyboard. Customising the controller assignments is also said to be easy. The Impact LX88 ships with a copy of Studio One Artist, and should be available immediately in some areas. It'll be rolled out worldwide by the end of February priced at £220/$320/€290. Find out more on the Nektar website.